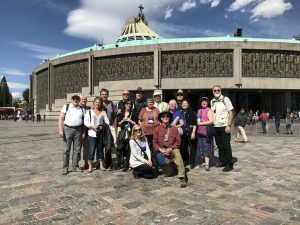 [NoCache] Most of our group in front of the Shrine of Guadalupe after we had Mass in front of the Tilma Our Lady of Guadalupe. Today we visited the Aztec Temple in the heart of Mexico City next door to the Catholic Cathedral. Tens of thousands of humans were brutally sacrificed and even eaten. 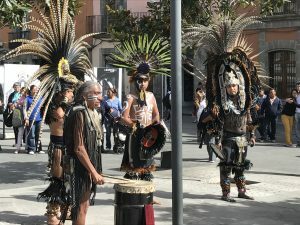 I gave a talk (see earlier video) contrasting the sacrifice of Christ and that of the Aztecs – and abortion.